Enhancing the curb appeal of your Toronto, ON, home is easy! In fact, when homeowners are preparing their homes to sell, sometimes all it takes to draw potential buyers in is to improve your entryway! And, here at Brock Doors and Windows, we know a thing or two about design and curb appeal—our entry doors have helped many families in this area! Keep reading for 7 Sure-Fire Ways to Improve Your Home’s Curb Appeal with an Inviting Entryway! This can include anything from mail slots to door handles. If you have worn-out kick plates or a faded house number, replace them! When potential buyers come to check out your home, the first thing they see is the level of care you—the current homeowner—has for the home. So, you want new, shiny accents on your entry door and fresh paint on the house number. If the door is no good, replace! Now, if your entry door is beyond needing a simple knob replacement, consider whether or not it may be time to replace the entire door. Remember, the first impression your home will make on potential buyers is right there in your entryway. If your door is dated, in need of repairs, or cheap-looking, come visit Brock and we will get you a worthy replacement entry door in Toronto. A simple doormat can improve the look of an entryway for very little cost. Find something charming and high-quality that will remove the grime from guests’ shoes and add a homey touch. If your entryway includes steps or a small porch, add life to it with a few flower pots or a hanging fern. Whatever you choose, be sure it isn’t obstructive. You want it to add colour and symmetry, without creating a maze. If your entry door does not currently have any decorative moldings, pre-sale is the right time to add a nice trim. Trim adds drama to the entryway; the kind of drama homeowners are looking for. If you have a good door, but its colour seems to match every other house on the block, consider painting it with a new, bright colour—red, yellow, even purple—to make your home stand out! A can of paint is very inexpensive; just be sure to buy a weather-resistant option. Sometimes, though, replacement is necessary and in that scenario, our team will help you select the right pop of colour for your new entry door! You’ve seen them everywhere on Pinterest and There are all sorts of “welcome home” signs made of metal or scrap wood with beautiful handwriting or carving that will definitely tell potential buyers they’ve found their new home! 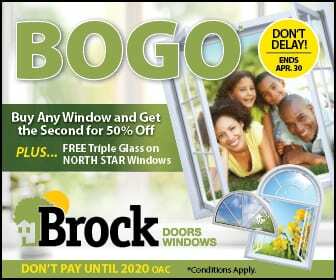 For more tips like these, check out our blogs or come visit our team here at Brock Doors and Windows! We look forward to helping you get your house ready to put on the market!